Drive around either island for a bit and you’ll notice that the ecosystems change rather quickly. One minute you may be cruising through sheep paddocks or a temperate rainforest and perhaps just a few kilometers later find yourself heading into some desert landscape that looks to be of another world. My wife and I found this out after we both quit our promising office jobs to go live in New Zealand for a year. We didn’t really know what to expect, but we knew we wanted to go and how to make it happen. It only took us a few days to find our new home on wheels. 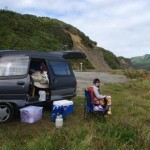 Truth is, you don’t need to be rich to campervan around New Zealand and it is actually quite affordable. This island nation in the Southwestern Pacific Ocean is home to what are perhaps the world’s most stunning natural landscapes. Living out of a van is the best way to take it all in because it allows you to access all the best places in the most cost-effective way. It is a simple process to rent a campervan from a number of companies that specialize in this or you can go and buy your own van. If it is not set up as a camper, just pull the back seats out and build a bed frame. No building skills? Go to a site like Gumtree (NZ’s version of Craigslist) or the bulletin boards around town and put up an ad soliciting help. You can also go to a hardware store and may find assistance there. If you are buying your van, try and begin your search in a sizable city with a decent population and at least a few hostels and campgrounds. Most travelers that buy a campervan will need to sell it once their journey is over and if you look around the bulletin boards and parking lots, you may even find one that has already been modified for life on the road. An important consideration when purchasing any vehicle in New Zealand is that this country requires a Warrant of Fitness, which basically means that it has passed an inspection and is road-worthy. You’ll need to make sure that the vehicle has this certification before you buy it or else you will be responsible for the repairs that will bring your van up to spec and allow you to transfer the title into your name. Once you’ve found the right vehicle you only need to decide which direction to go. Depending on the season and your individual priorities, it is a good idea to identify what you want out of the trip. If you desire more natural beauty, you may want to hike deep into the forest on the many multi-day treks that the Department of Conservation has created. Trekking is a popular activity that allows you to immerse yourself in the temperate rainforests that are found around the North Island and cover much of the South. To make things a bit more comfortable, a network of around 1,000 huts throughout these trails lets you sleep a little easier along the way. These are basic sleeping facilities that protect weary travelers from the elements by putting a roof over their head, a pad to sleep on and a sink to wash in. This hut system creates a very unique backpacking experience that allows for socializing with your bunk-mates and staying in unforgettable little cabins. If privacy is your thing, just bring a tent! If money is on your mind, then hop on the harvest trail and pick fruits and veggies along the way or find a tourist area that has a high turnover of travelers and look for work there. Many farms, orchards, and lodging will offer their employees some facilities to utilize while they stay in a tent. Some will even provide a dormitory or private rooms that offered in exchange for work. This also creates a social environment where you work and live with other travelers, while sharing memories and advice. After buying our van, my wife and I headed straight to the South Island because it is so uninhabited. Our priority was to get away from it all and this finally happened when we got to the West Coast. It was like arriving in a natural Wonderland and we immediately fell in love with the fresh ruggedness of the coastal terrain and endless forest. There’s a saying in the USA that the West Coast is the best coast and we found the same to be true down under. This part of NZ is a magical land of dense rainforest, desolate coastlines, and amazing flora/fauna. There aren’t a lot of people around here, which offers all sorts of opportunities to camp for free right next to the ocean or along a river down some random gravel road. The best part of campervanning is the ultimate freedom that you give yourself. You can do whatever you want because your home is always right there. Your commitment is to yourself and not a lease. And while you are there having the adventure of a lifetime, don’t forget to look up. The night sky in New Zealand is the most stunning that I have ever seen and living out of a van had us admiring it every night. Most evenings we would find a private place to park that was off the beaten path and would set up our chairs and pull out the grill a couple hours before sunset. After having a proper feed, we would lie back and enjoy our front row tickets to the moon.